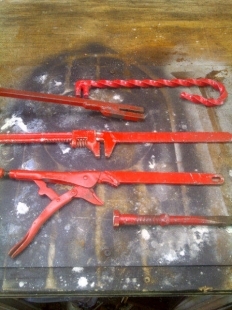 Homemade forging tools utilized as aids for bending, twisting, and welding operations. Some were adapted from existing tools, such as a Vice-grip, pipe wrench, and chisel, while others were forged from stock. Very clever...and beefy tools. Good idea!